Last week I promised florals dresses and perhaps even toenails – and I’ve managed to deliver on both! As we’ve had some beautiful sunny days on and off in the last couple of weeks (temperatures were up and down a bit, but the change in season is definitely happening) I thought I’d feature some of the best summer dresses I’ve seen so far this year. I’ve picked my five favourite dress styles (all of which I own one or more of), shown you how I’ve styled mine, and suggested ones you can shop that are currently available online. So if you’re a fan of shirt dresses, slip dresses, classic yellow dresses, wrap dresses or gingham dresses then it’s your lucky day! I’ve found so many I love that I now want to go out and add to my already-heaving collection of summer dresses. Disclosure: This post contains affiliate links which means if you click through and buy I may receive a small commission at no cost to you (click here for my full disclosure). Any items listed as* were gifted within the last 12 months. Hopefully this post is a nice antidote to the masculine chic look I featured last week. It’s time to start buffing, and fake tanning, and toenail painting, and waxing and all those other things which occasionally slide over the winter months. Do add your outfits to this week’s link up – and if you’ve added a link to here or my button to your post you may be featured in my bi-monthly Women Who Wear What They Like post! 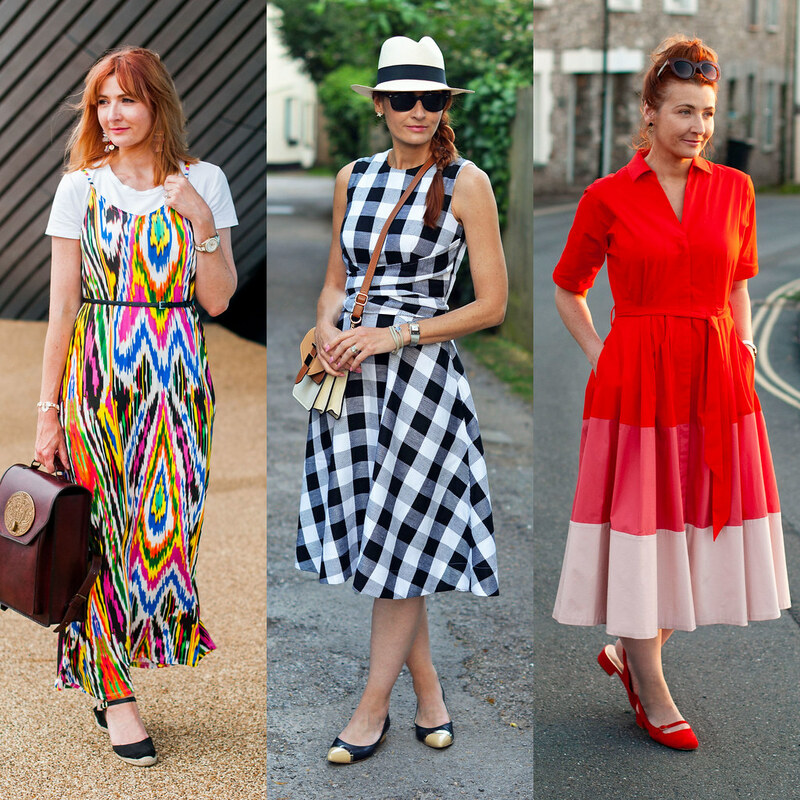 LET ME KNOW WHICH IS YOUR FAVOURITE STYLE SUMMER DRESS IN THE COMMENTS…! If a shirt dress is my favourite style dress, then yellow is my favourite colour for a summer dress. I have several yellow dresses, and every year I find myself looking at what yellow dresses all the shops are selling in their New In sections. I think it stems from my love of the dress Sandy wore to the diner in Grease – my mother made a dress that was almost identical as I loved it so much. I even remember the yellow sundress I owned aged about four – it had a little bear transfer mum ironed onto the front for me… GAWD I loved that dress! Over 40 years later and my love for a yellow sundress is still strong. I’ll be honest here: I wouldn’t say I’m generally a fan of a wrap dress. But normally “wrap dress” makes me think of a bodycon style, with long tight sleeves and a knee-length, tight skirt… that style looks TERRIBLE on me, and it’s not my style at all (plus dare I say it… it’s a bit old fashioned now?) But last year I bought two Hotsquash cooling fabric wrap dresses (grey is still available in a few sizes, as is pink) and they were a godsend in the heat. With the shorter sleeves and maxi length they were nothing like the cliché wrap dress I mentioned. So I’ve picked more unusual style dresses for this section; wrap dresses yes, just nothing run-of-the-mill. The slip dress is a style I thought I’d NEVER wear again, let alone styled the 90s way with a plain white t-shirt underneath. But two years ago I ate my words and got this rainbow ikat-print dress with straps, and wore it with a white tee I did. The style is still going strong for 2019 it seems, and it can be worn alfresco for very hot days or with the white tee I mentioned for a more covered-up look. A belt to cinch in the waist: optional. EVERY year gingham dresses are popular, especially black and white gingham. I honestly don’t think this print will ever really date (Dorothy in The Wizard of Oz, anyone? ), so a really fabulous B&W gingham check dress is a summer investment in my eyes. My Hobbs gingham dress is about four years old and every year I can always find one that’s almost exactly the same (like this one from Hobbs and this one from Karen Millen). I’ve got my eye on a gingham jumpsuit this year…! The link up goes live every Tuesday at around 3pm UK time and will stay open for a week. Whilst the original article was of course aimed at the 30+, you can be ANY age to link up. The only prerequisite is that you’re wearing whatever you damn well like! Click here to receive an email reminder for the next #iwillwearwhatilike link up as soon as it’s live! PLEASE NOTE: This is for linking up WHAT YOU’VE BEEN WEARING ONLY. Non-outfit links will be removed and you might be blocked if you turn out to be a repeat “offender” (and no one wants that, do they…)! Next Post The “Influencer Look”: Whatever Happened to Individuality in Blogging? Beautiful choice of dresses & you suited them all ! Struggled to find a favourite, perhaps the shirt dress won by a whisker ….but there again !!! Those flats looked very comfortable & stylish on the picture of the slip dress, can I ask where you bought them ? Oh, Catherine I was so determined not to splash out too much on my summer wardrobe – but this post has made me change my mind !…..I NEED dresses !!! Hi Karen, sorry for the very late reply! If you meant the black espadrilles with the ikat print slip dress then they’re actually wedges, not flats at all… they were bought a few years ago but you can still get lots like them, if you want a flatter pair I found some at Asos by Miss KG, and they’re on sale too! https://rstyle.me/+rrktxXTwcq6tp0pgKiVzzg (hope that’s the sort of thing you were after)! Oh, there are so many of these that I love! I am hoping to wear more dress this year but I am looking for dress like these that let me move! Thanks Mireille – I agree about the being able to move thing…! So I’m scrolling through nodding, ooh yes shirt dresses are definitely my favourite Oh wait no wrap dresses are definitely my favourite, then…awww that yellow is pure sunshine etc etc etc Damn you Woman! Ughhhhhh Mango sell such fabulous dresses!! I absolutely love all the dresses but the gingham one is my favourite. I love most of these dresses – but adore the Gingham dress. You look stunning in it. I love having a few dresses in the summertime – they are so easy to wear and can be so flattering. Catherine love your choices I a shirt dress girl all the way and I love yellow! my fave one on you is the red colour block one its drool worthy! Those dresses are gorgeous. I especially love the gingham one. So many gorgeous dresses on you and dress picks as well! I absolutely adore that yellow floral dress. Stunning! Can t wait to wear Summer dresses! But first it s going to freeze here in the Netherlands tomorrow! Can you believe it! Your selection is perfect! All different styles and colors! Never would have thought that yellow would look that good with your Hair color! A lovely selection of pretty Summer dresses, hope Mother Nature plays along and you are in them before you know it. Heading into Autumn here after a hot, dry Summer. Enjoy your Spring Catherine and many thanks for hosting. I love summer dresses but somehow dont wear them very often I revert to co-ords for work. Must change that. Great selection! So many super summery styles here, Catherine. I particularly fond of that shirt dress. Spring is in full swing. Thanks for the linkup. I’m glad I made it back! Catherine, I adore all the dresses, but especially like the funky slip dress, the gingham and the yellow. Of course, I always love anything in yellow! As you said, time to start buffing and tanning. Yikes. Summer will be here before we know it, right? How funny, I was just searching for dresses earlier today—every year, I search for (and rarely find) the perfect white dress. I do have yellow and gingham sundresses that I can’t wait to wear again!